Jay Ruderman is the president of the Ruderman Family Foundation, a leading funder of disability advocacy in the Jewish community and programs strengthening the relationship between Israelis and American Jews. Although originally from Massachusetts, Jay now lives in Rehovot, Israel. He blogs at Zeh Lezeh (For One Another) and is currently preparing for the second annual Advance Conference focused on funding Jewish special needs initiatives. Why has advocacy for Jewish people with disabilities become so central to your philanthropy? The teacher-student relationship is held in such high esteem in Jewish tradition that our sages compare it to that of a parent and child. But as students progress, they can become colleagues and even rivals to their former mentors. This challenging dynamic is at the heart of Collected Stories, the 1997 play by Donald Margulies now playing at the New Repertory Theatre in Watertown. 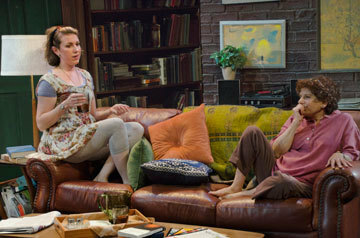 Collected Stories largely succeeds on the strength of its two dynamite performers, Liz Hayes as emerging writer Lisa Morrison and Bobbie Steinbach as her mentor, Ruth Steiner. Steinbach creates a figure who is equal parts Philip Roth and Elaine Stritch; a figure to be reckoned with, surely, but she doesn’t overwhelm the stage. Her measured delivery makes it clear that Ruth is a thinker, sometimes to the point of thinking away her emotions.